It’s not the largest or most elegant church in Europe. It pales next to Notre Dame or Westminster. But among the churches of Zurich, it is certainly one of the loveliest and most recognizable, its thin spire dominating the skyline over the Limmat River. June 2016, single image, additional exposures for highlights, focal length 16mm, aperture f/11, shutter speed 5 seconds, ISO 64, tripod. The church has occupied this spot near Paradeplatz since AD 853, when it was built by King Louis the German as an abbey for aristocratic women. Perched at the west end of the Munsterbrucke, the pedestrian bridge crossing the Limmat, Fraumunster is a landmark in the medieval part of Zurich. Though the church has ancient origins, its most characteristic feature (aside from its verdigris spire) is the stained glass windows by Marc Chagall installed in 1970. The artist was in his 80s when his five windows were installed in the church, each one depicting a different Biblical story. Each long panel was created in a dominant color, which has the effect of bathing the church in brightly colored light. 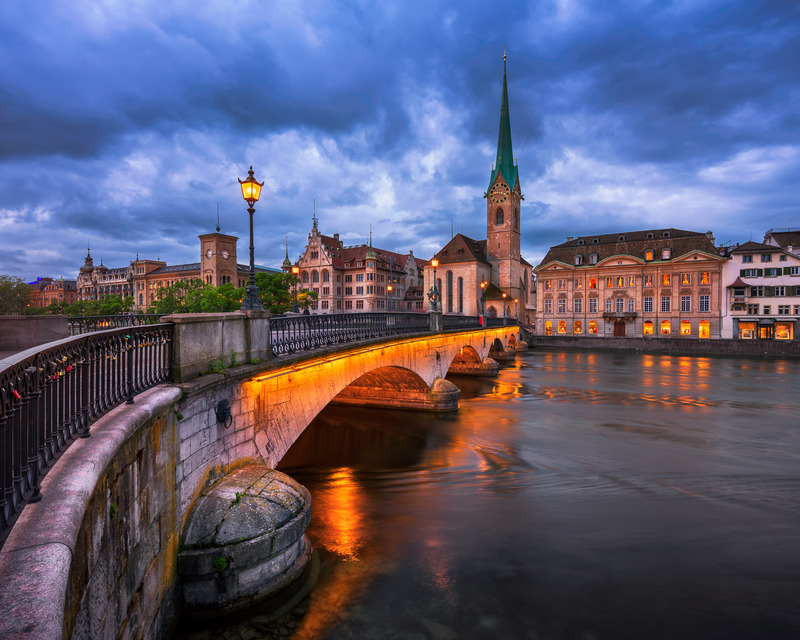 In the late evening, when I came to Fraumunster, the bridge and the church are draped in the soft glow of twilight against a backdrop of dramatic clouds. I photographed the church from the behind the gentle curve of the Munsterbrucke and let the church’s spire form the focal point of the photograph, with the lighting of the bridge and the street for subtle illumination. This entry was posted in City and tagged Switzerland, Zurich.